It's all gone mad, I tell you. Cool huh?! It's 95% accurate, which isn't bad for Simply Knitting ;) the screen shot is an old one, as I've made a few changes in this last month but I ain't gonna complain, honest. Ta to Hazel and Sue for scanning the page (shall be out on a mission to get meself a copy tomorrow) and to MLQ for filling me in. This is my first 'proper' review, and I like the fact that it mentions my style of work - makes me feel as if I have achieved something! 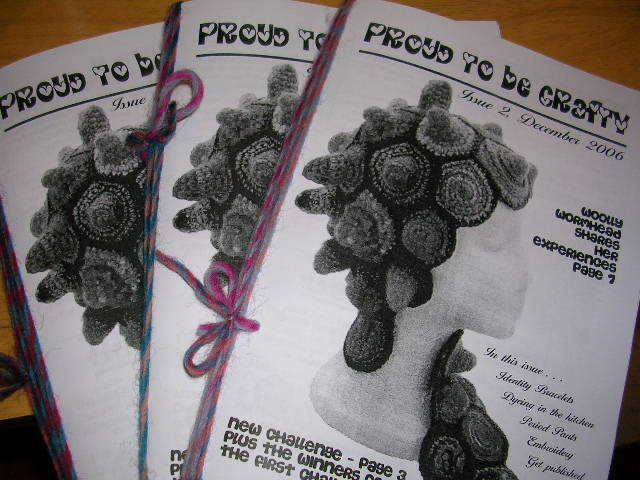 The 2nd edition of Proud To Be Crafty is now available. Lixie puts loads of work into this zine and it's worth a good read (go buy!) And look who's on the front cover! There's an interview with me inside, and hopefully Lixie has edited it sufficiently so that I don't sound like some blathering idiot. There'll be loads of other great stuff too from other bloggers - nice that we can all contribute. Other news? The Knit Tin customers have gone completely mad and bought nearly all of the latest batch of hand-spun to arrive in shop. Something like 11 skeins of 20 sold in what, 4 days?! So that's keeping me busy and out of trouble. You'll be glad to hear there's a faint hint of organisation and planning creeping in. Have started to order fleeces ahead of need (aha! Just an excuse for stash enhancement) and making sure that I have at least a few yarns ready for the next order.... takes the pressure off, I've discovered, which is a bonus. We've been to look at a couple of trucks but nothing yet has grabbed us. We've discovered a Mercedes commercial vehicle dealer in Erith, about 20 minutes drive from us, which is super handy! We've gotten use to driving all over the country looking for the right wagaon and then we go and find one on our door stop. They get 2nd hand midibuses in from time to time - we saw one of the last batch, and think we may go for one of those. They have a proper electric door that concertinas like you find on larger buses, and little steps to get inside, which is kinda cute. And aluminium bodies which is something that is hard to ignore, in this game of rust maintenance and weight limitations. Size wise they're not as tall as out last truck, but a wee bit longer and wider. And with a much bigger engine that's been reguarly serviced - nice - they're 709's, which are basically small lorries! ('scuse me getting technical) The only downside is thought of driving a full on advert for StageCoach. Respray needed. Anyhow, the whole world and his cat will know when we get a new truck. There were a few problems with the website whilst I was 'away' - mainly with buying patterns. Hopefully now it's all sorted. Still can't fathom what went wrong, but deleting all the products and re-entering them all did the trick. Technology, eh? Before I go, I must thank everyone again for their kindness - you never cease to amaze me! Please forgive me if I don't reply to all comments left regarding my eyes - there were a lot. The worst part of it is over, but the iritus is still with me... shall need to take the steroid drops for another 4 or 5 weeks yet. But hey, it's such a relief to be able to read clearly again! The ears have completely blocked again and have gotten yet another rotten cold and blocked sinuses... yet none of it is getting me down. There's way too much good stuff going on. Wormhead's going somewhere and life is great. Doh! I completely forgot to mention this. This is a must-have screen-saver that Tom found for me. Super funky sheep, each with his own personality, floating through space. Superb. Loads better than my last one. Rotten blogger doesn't like the link to the download page...... Hopefully this will work....! Added:- Yep it works. Now go get it! Trust me - you'll love it. And it's free.